W1-0015: View of Pyramid of the Moon from the Avenue of the Dead The Pyramid of the Moon, or Pirámide de la Luna, is one of Teotihuacan’s most spectacular structures, partly because of its colossal size and partly because of its distinctive architectural style and iconic position at the end of the Avenue of the Dead. 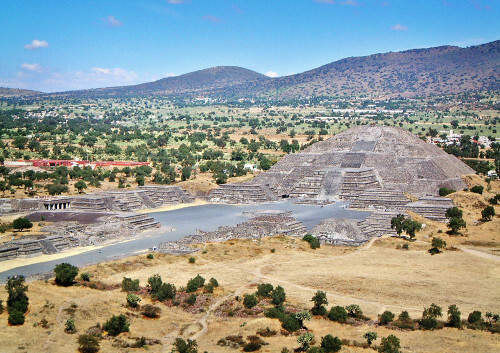 Yet, despite its huge dimensions, standing 43m tall and measuring a massive 130m x 156m at its base, the Pyramid of the Moon is still dwarfed by the incredible Cerro Gordo, or “Fat Hill”. This giant hill constantly frames the pyramid as you approach along the 2km section of Avenue of the Dead from the southern entrance. This effect is quite intentional and is deliberately accentuated by the Pyramid of the Moon’s low profile and large base, which replicates that of the hill. 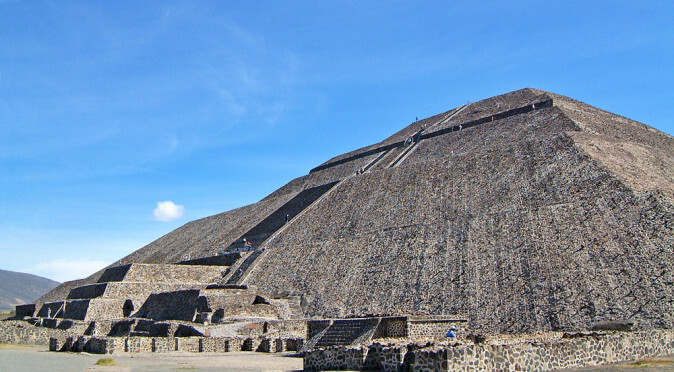 It is quite clear that the builders of Teotihuacan wanted people to focus on the huge hill looming over the city and built the Pyramid of the Moon to both venerate the Cerro Gordo and emphasise its awesome size and power. 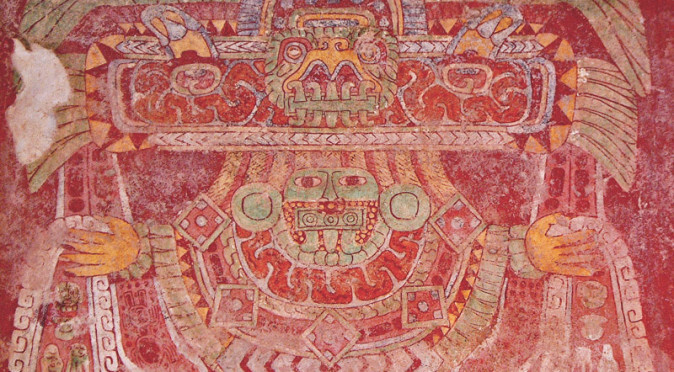 This reverence is demonstrated by a mural known as “The Paradise of Tlaloc”, which is found on the walls of an apartment in the Tepantitla Complex (fig. W2-0025). W2-0025: The Paradise of Tlaloc The mural features a large blue mountain that flows with water and irrigates the fields in which farmers are shown sowing seeds and reaping crops. Not only does the mural reflect the belief that Cerro Gordo provided the life-giving waters that kept the city nourished, but it possibly pictures the Pyramid of the Moon standing in front of the mountain. 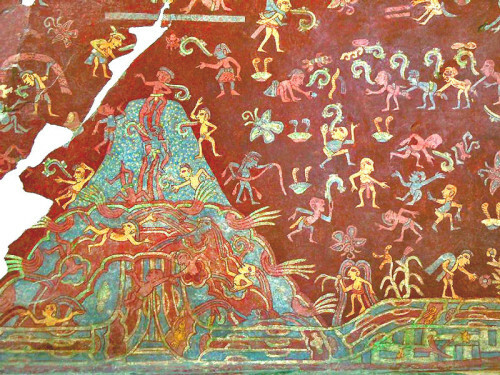 Following several stages of development, the Pyramid of the Moon eventually did represent the Tlalocan Mountain, with its top tier capped with a temple and acting as the mountain peak, followed by the two stepped protruding façades that present the appearance of the cascading water that arches across the mural (the blue and red bands), then finally, the talud-tabero Adosada platform that extends in front of the pyramid acted as the lower blue section from which the waters of vitality flow (the talud-tablero style may have designed specifically to represent this cascading water – see fig W2-0025 and note how the water cascades down and then up again in the mural, then look at W2-0007 and how the talud-tableros cascade down the pyramid and then up the structures that line the Avenue of the Dead). 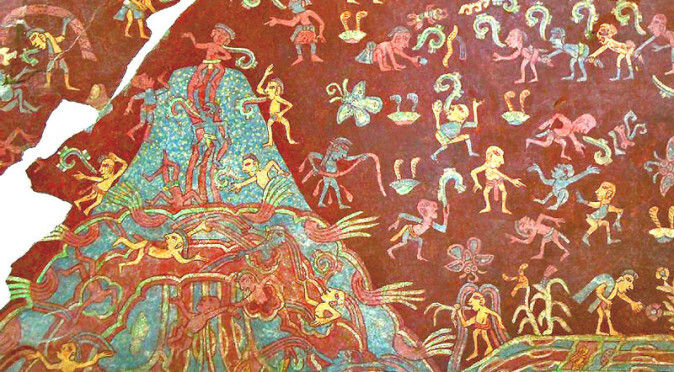 W2-0007: Pyramid of the Moon But far from paradisical, the events portrayed in the “Paradise of Tlaloc” mural quite graphically detail the deadly ball-game, sacrificial slaves bound together and, most importantly, humans being fed to the mountain. This unusual process starts at the top of the mountain, where the torso of a red man pokes out whilst his lower half streams as blood down into the mountain. Bodies then tumble down the mountain – some of them headless – in a river of blood. 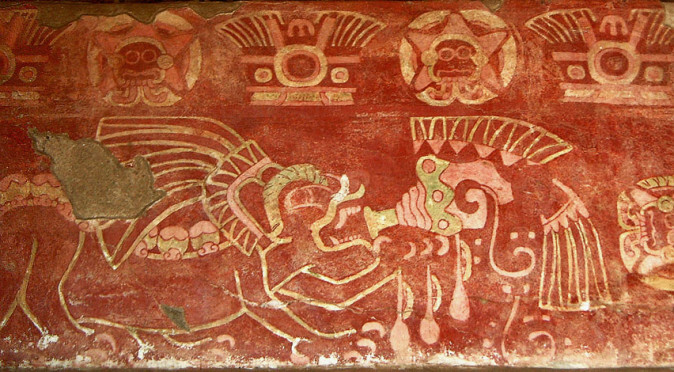 The blood then churns within the mountain to produce the cascades of life-giving waters that keep Teotihuacan well fed. This gruesome process was evidently the Teotihuacano vision of how the world worked and what was required to keep the Gods fed, the waters flowing and the harvests maintained. To help them complete this task, and provide a constant reminder to the population, the Teotihuacano built the Pyramid of the Moon. W2-0004: Plaza of the Moon To this end, it is almost certain that an annual festival, which may have run for weeks or months preceding the wet season, would have taken place around the Plaza of the Moon, with the primary focus being the slaughter of captives upon the Pyramid of the Moon. Their sacrificed bodies would then have been sent tumbling down the sides of the pyramid and their blood would have flowed down the stairs and into the symbolic mountain. This striking re-enactment of the mural of Tepantitla would be completed with the coming of heavy rains, which would have reproduced the bloody river of vitality as it washed the blood away. 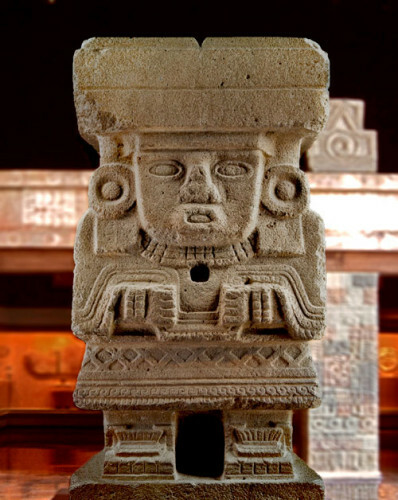 The result would have been an awesome realisation of the Teotihuacano religion that would have validated the Teotihuacano belief-system and unified the immense population in their daily religious activities – which also provided law and order. W2-0012: View from Pyramid of the Moon The landscape surrounding the Pyramid of the Moon was certainly designed to host such significant religious events. Directly beneath the pyramid is the Plaza of the Moon, which measures a gigantic 120m by 132m (to get an idea of this scale, you can see people walking into the plaza from the avenue in fig. W2-0012). 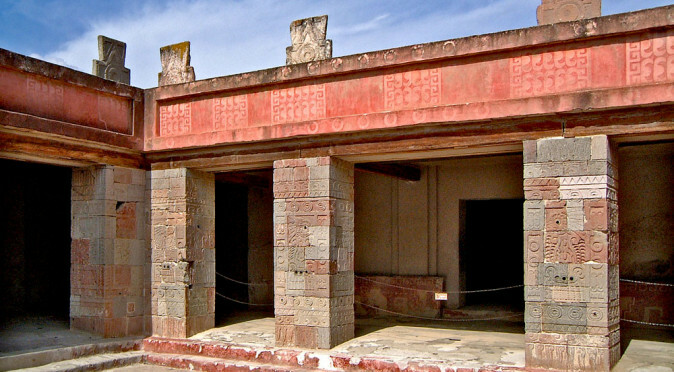 The plaza is surrounded by pyramidal bases that would have housed temples and provided viewing platforms for the elite. These pyramidal structures extend beyond the plaza and line the Avenue of the Dead for over a kilometre to create a phenomenal religious procession way that leads directly to the pyramid (fig. W2-0012 looks down from midway up the Pyramid of the Moon). 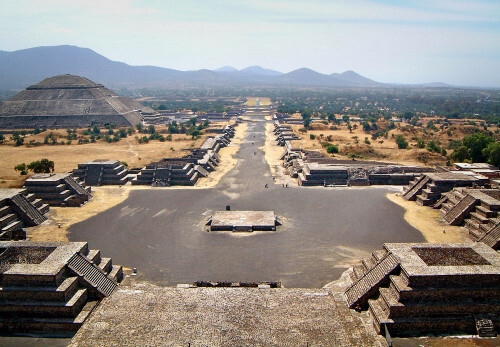 The Plaza of the Moon and the Avenue of the Dead would certainly have accommodated the 100,000 strong population of Teotihuacan, plus many more from the surrounding area, as well as providing ample raised viewing platforms for visiting nobility, the city’s dignitaries and the religious elite. No doubt, the sacrificial victims seen bound together in the mural of Tepantitla would have been paraded along the Avenue of the Dead to the Pyramid of the Moon to meet their destiny. The Avenue of the Dead would have also provided ample space for playing the ball-game pictured in the mural of Tepantitla, with the pyramidal structures delineating the court and providing viewing platforms. The losers or winners, or possibly both, would then have been sacrificed to the mountain. W4-0011: The Great GoddessFurther ties between the murals of Tepantitla and the Pyramid of the Moon can be found in Museo Nacional de Antropoligia in Mexico City. There, a huge statue of the Great Goddess stands amongst the exhibits removed from Teotihuacan (fig. W4-0011). The statue stands a mighty 3 metres tall and originally stood in the Plaza of the Moon. It is thought to be of the same Goddess that features in the murals of Tepantitla, where she features above the mountain and is being given offerings by the priests in return for water (click here to see the page on Tepantitla). The likeness is also in keeping with the mural of Tetitla, where the Great Goddess has water symbols cascading from her hands (click here to view image). Further evidence that the mural of Tepantitla does describe events held around the Pyramid of the Moon has been found buried within the pyramid. Thus far, archaeologists have uncovered seven sacrificial burials within the pyramid, most of which contain humans that were bound, sacrificed and placed neatly in the grave with offerings of jade, pottery, obsidian, etc. One grave contained 17 skulls with the upper vertebrae still intact and showing signs of severance, with additional cut marks found on the mandible. This suggests that their throats were cut, their heads were removed, and their bodies were discarded. This again strikes accord with the mural of Tepantitla, where two headless red bodies fall down the mountain. ASU-TEO-1: Phases of Construction The burials found within the Pyramid of the Moon were very specific and were certainly designed to consecrate each additional phase of the Pyramid of the Moons construction – of which there were seven. And here lies a paradox, for although the structure we see today appears to have been built to venerate Cerro Gordo and the Tlalocan mountain, the original structure was vastly different. In fact, it wasn’t until the fourth phase of construction that the pyramid form took shape (see fig. ASU-TEO-1 0012 – and you can click on the image to go to the Arizona State University website). The original structure, which was started between 100BC and 100AD, sits beneath the Adosada platform at the front of the Pyramid. Whilst it shares the same alignment of 15.25º east of north, it was not a mountain, but a low platform, and research into this unusual alignment suggests that it may have been dedicated the setting of the pleiades. 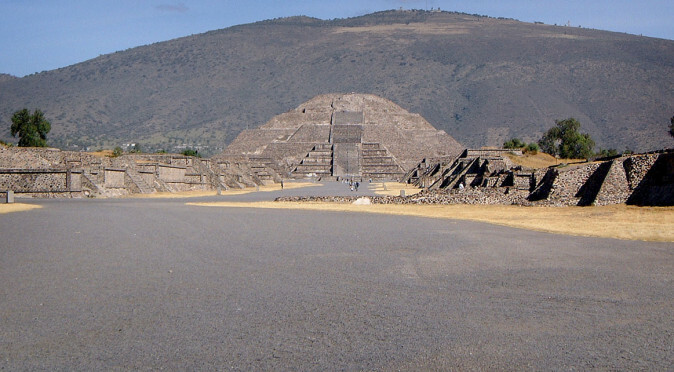 Curiously, the Pyramid of the Sun faces 16.5º north of west and pointed directly to the sunset on the same day. To assert the importance of this solar alignment, there were 260 days between its occurrence, which equals the number of days in the Ritual Calendar. 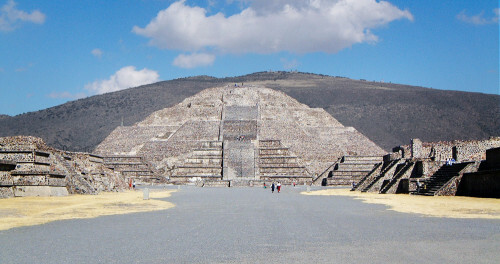 The relationship between the Pyramid of the Moon, the Pyramid of the Sun, and the Ritual Calendar was further emphasised in the fourth phase of construction, when the pyramid first took shape and measured 87.15m across the front. This meant it was 40% of the size of the Pyramid of the Sun, and 40% of 260 is 105, which together equal 365 and therefore make up the days of the Solar Calendar. 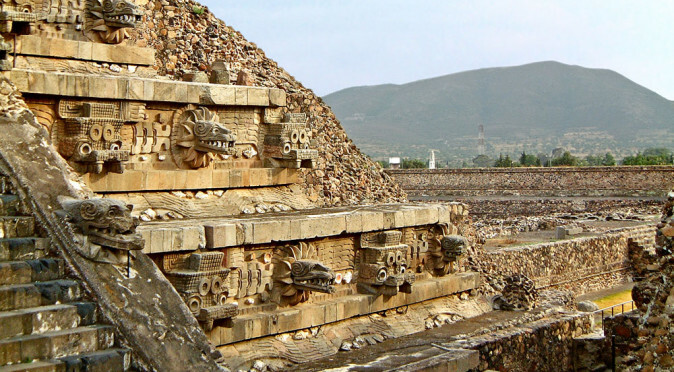 Further attention has been paid to the alignment of Teotihuacan’s three major pyramids, those of the Moon, the Sun, and Quetzalcoatl, which from above appear to echo the Pyramids of Giza by representing Orion’s belt. However, the sizes of the pyramids and the distances between them are too irregular. Based on these factors, especially size, it seems more likely that the Pyramid of the Moon does represent the Moon, which would tie in with the theme of water thanks to its gravitational pull. The Pyramid of the Sun could then represent the sun at the centre of the our Solar System and the Pyramid of Quetzalcoatl would represent Venus – which Quetzalcoatl is commonly linked with. The Avenue of the Dead, with all the pyramidal bases that line it, could also be associated with the Milky Way to complete the recreation of the heavens on earth. W1-0014: Looking at the Pyramid of the Moon Along Avenue of the Dead The Teotihuacano appear to have had no writing systems and used the cryptic symbolism painted into their murals to record their history, science and religion, and so it will be hard to ever prove these relationships conclusively. What is certain though, is that the Pyramid of the Moon and Cerro Gordo were intended to be the focus of the city, which is why the Avenue of the Dead leads for at least 6km directly to its base with the hill always looming large (fig. 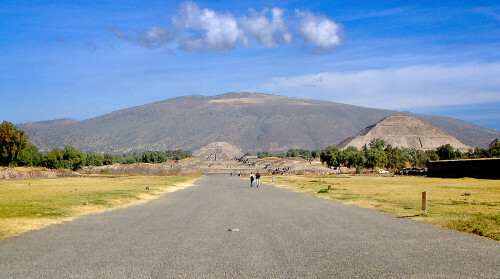 W1-0014 is the view from outside the Ciudadela complex, which is already 2km away from the Pyramid of the Moon and is still firmly within the cities ceremonial centre). 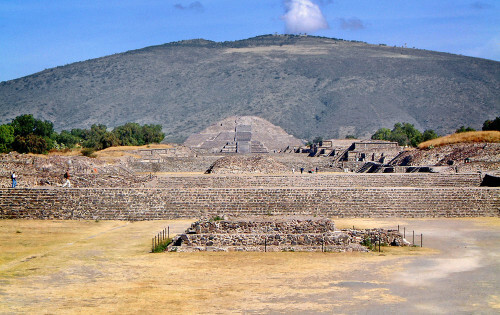 Also, at the foot of the Pyramid of the Moon is the Palace of Quetzalpapalotl and the Palace of the Jaguars, which are almost certainly the apartments of Teotihuacan’s royalty or very important state buildings. 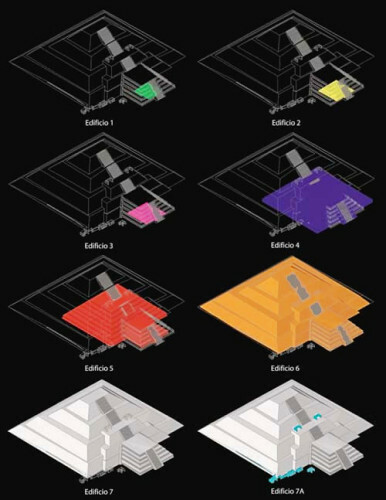 When looking at the city’s physical plan, it is clear it was built to an orderly purpose and with visionary forethought, and when you look Teotihuacan’s history it features those same characteristics. 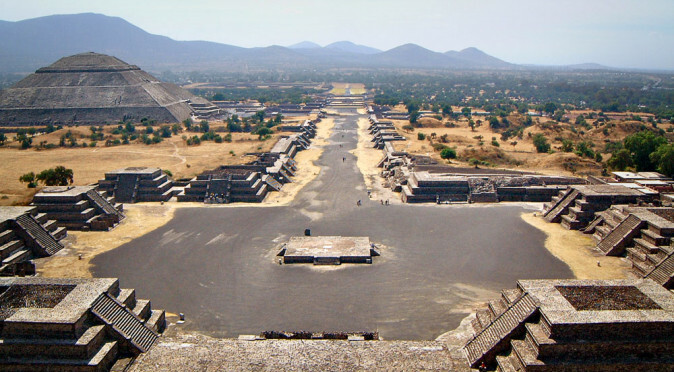 From the outset, it appears the founders of Teotihuacan had a master-plan for building the world’s most powerful city and so it is quite likely that the phases of the Pyramid of the Moon were predetermined. The relationship between the Pyramid and Cerro Gordo always existed, for even when the pyramid was little more than a base it still pointed, with the help of the Avenue of the Dead, directly to the mountain. Interestingly, and perhaps by chance, this alignment also points to the obsidian mines of Pachuca, some 50 miles away, where the city’s success actually came from. By 250AD the Pyramid of the Moon had taken the shape of the mountain we see today and the rest of the ceremonial city-scape had been completed. At the same time, the Teotihuacano exploded politically, and militarily, to dominate the Mesoamerican landsacape. It is little wonder that people believe this was the City of the Gods, for when the first brick was laid, the foundations of an empire were laid with it, and their founding ideologies thrived for hundreds of years after the city lay abandoned and were still being used by the Aztec Empire when the Spanish arrived. The Pyramid of the Moon has been excavated and studied by Arizona State University since 1998 and you can visit //teo.asu.edu/research/pyramid-moon-project-1998-2004 to find out more about their archaeological findings.